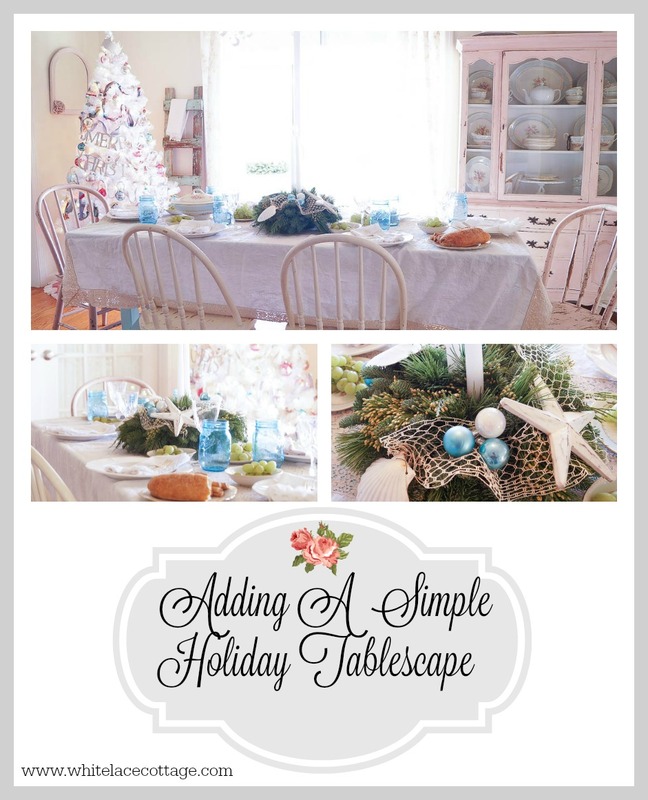 Today I wanted to share a very simple tablescape idea. I no longer have my dining room table, I converted my dining room into my studio office. So the only table I have for sharing a tablescape is my kitchen. This may be the last time I share a tablescape on this kitchen, because I may be getting a fabulous vintage shabby table, fingers crossed! 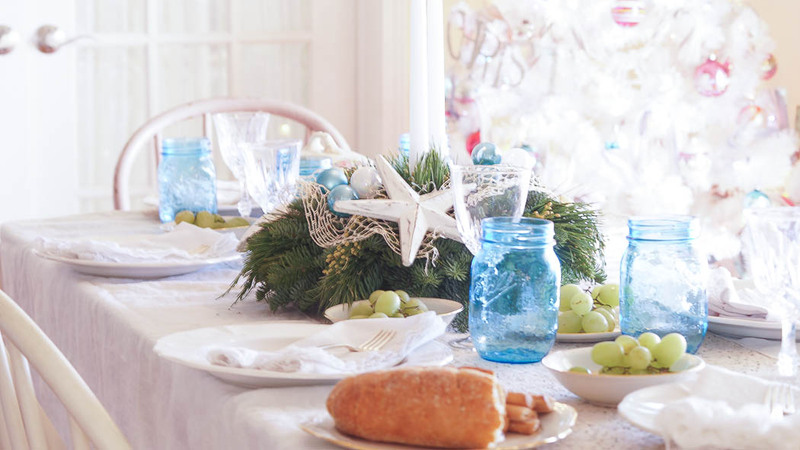 When you’re thinking about decorating a tablescape think about simplicity. I don’t like going overboard with too many pieces on my table. Because the reality is that when you are actually sitting at the table with the food all placed, you need room to move around. You also don’t want a tall centerpiece blocking your view from your guests. This centerpiece from Lynch Creek Farms is the perfect height and size. I placed candles inside of mine, but you don’t have to do that if you don’t want to. I do think it adds a touch of elegance. Since my kitchen has hints of turquoise, this centerpiece really works well. I just added my plain white dishes, instead of my pretty blue dishes. I was just thinking simple for this table. 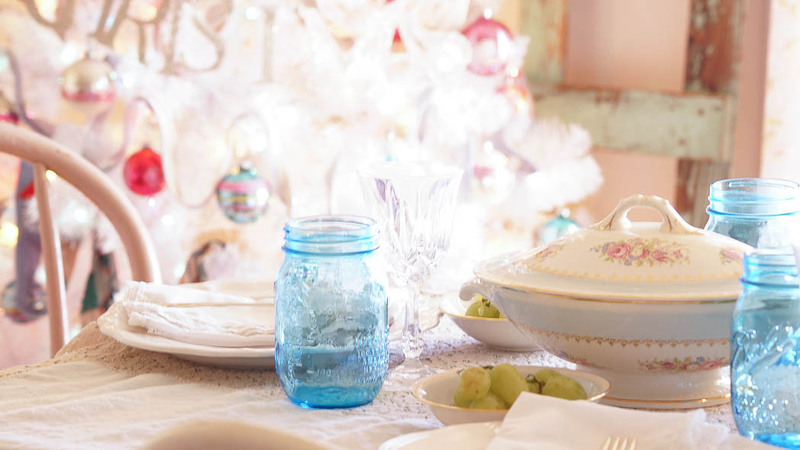 I do have pops of color with my blue ball jars, serving plates and my small fruit bowls. A lace tablecloth is pretty for any occasion, in my opinion. It’s timeless, and ads a nice neutral backdrop for a tablescape. And a simple lace napkin with your utensils is all that you need. 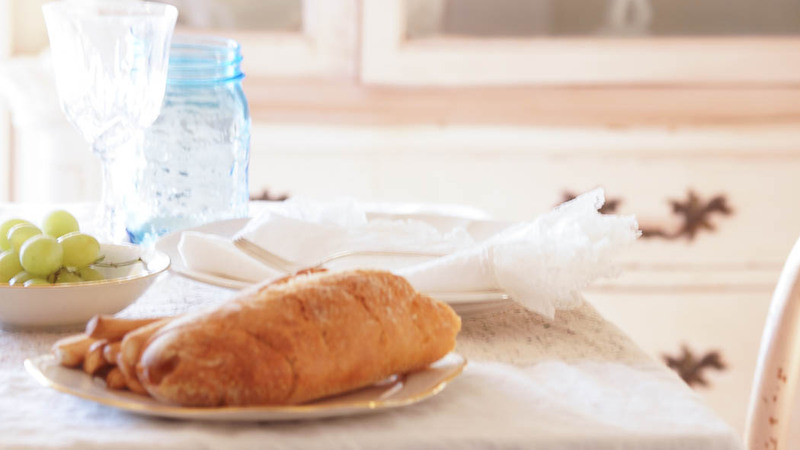 Bread can also be placed on a small plate for serving instead of a basket. Okay, let’s stop here, I bet you’re wondering why I have bread. Ha, yeah this was left over from our dinner on Saturday night. We were in Chicago celebrating my daughters 16th birthday. I enjoyed every bit of my dinner, but alas, I had no dessert! Doesn’t this look fancy in our kitchen! This was set up for my post only, I don’t set up the table like this every night. But I hope it shows how pretty a table can look using very little. Really, if you look closely, I’m not using anything too fancy. But yet, it looks very pretty! So, you have a centerpiece for a table, but you’re not a centerpiece kind of person. Or you’re not going to host a dinner, why do you need a centerpiece? What about adding a centerpiece to a coffee table? 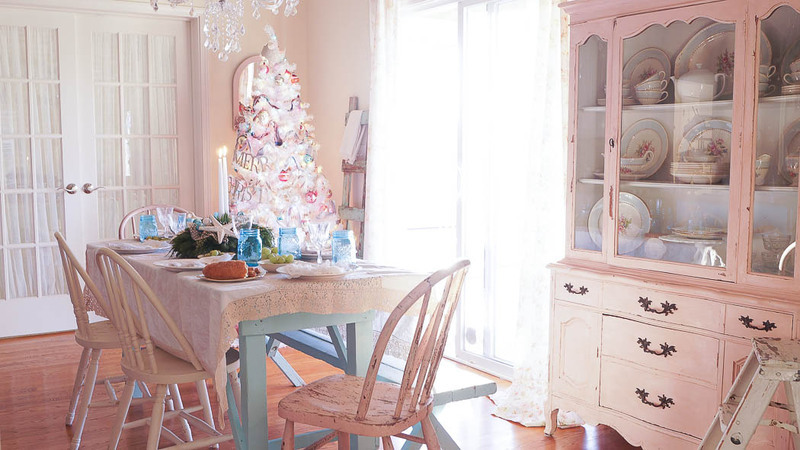 It’s a beautiful way to add holiday charm to a room without over doing it. I decided to place it in my wood tray, but you don’t have too. I just prefer the layered look. I have these beautiful colors in my living room, so this works perfectly. And I love that this is not a traditional centerpiece. I have nothing against red and green, but it doesn’t work in my house. When you are looking for a centerpiece, purchase one that works with your decor. 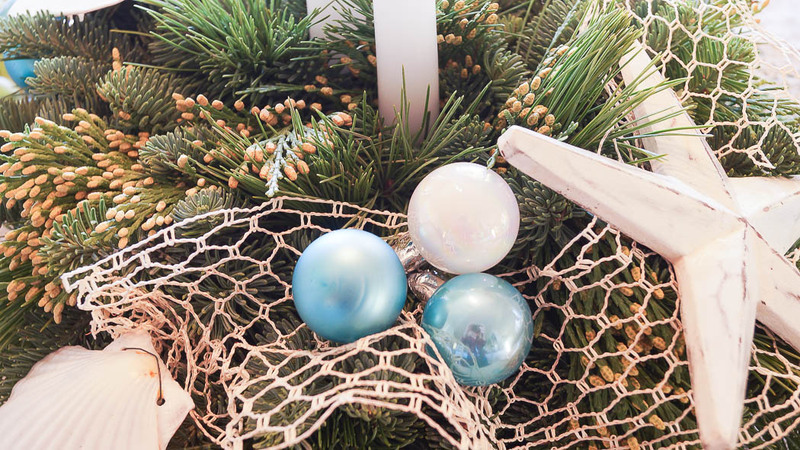 Two readers will get a chance to win a gift certificate so you can choose your own wreath, centerpiece or garland! 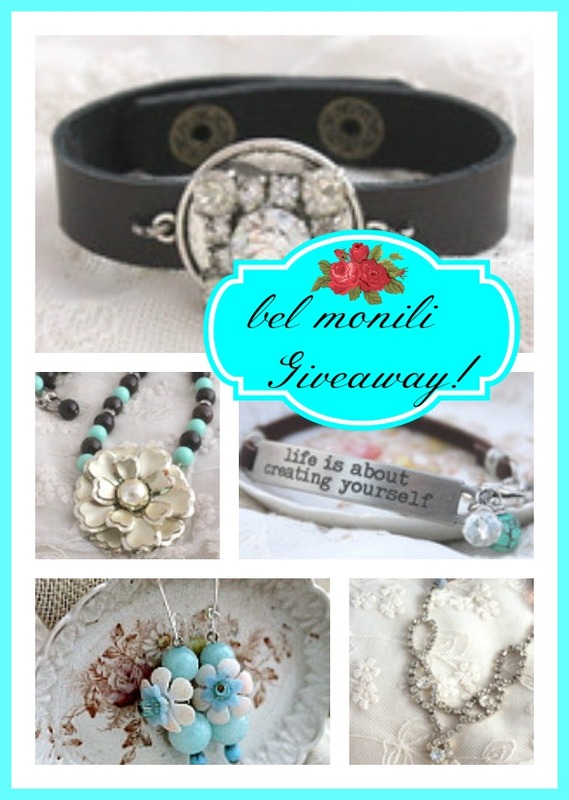 **Don’t Forget To Enter For A Chance To Shop Bel Monili! Value $35.00! « DIY Holiday Reusable Bag And A Giveaway! 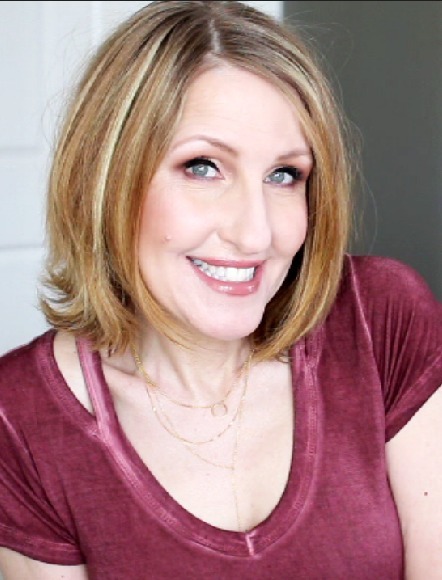 When I see your photos, I want to put on a pink tutu skirt and pink cashmere sweater and come enjoy all the soft colors in your home. LOL Will there be pink cookies? I hope so. Surely you lounge around in your own tutu and sweater, Anne? I agree, simplicity works best for me during the holidays. Love your special touches. Fresh greenery is always a winner in my book! Since we have painted our living room the light grey (over year ago), red/green holiday colors just won’t do it for me. Going more for silver/gold/aquas/white. Since I’ll be having surgery on 12/7 this year hubs will be doing any decorating to be done. Not getting boxes out, am going to use just few things have gotten at $tree and what I’ve made. Have to take it easy this year for holidays, life will go on. All that mess after holidays putting it all away is just more than will be able to deal with. Having right shoulder replaced. A table is a place a family or friends can gather to eat and enjoy each others company and that is exactly what you have and it is lovely. 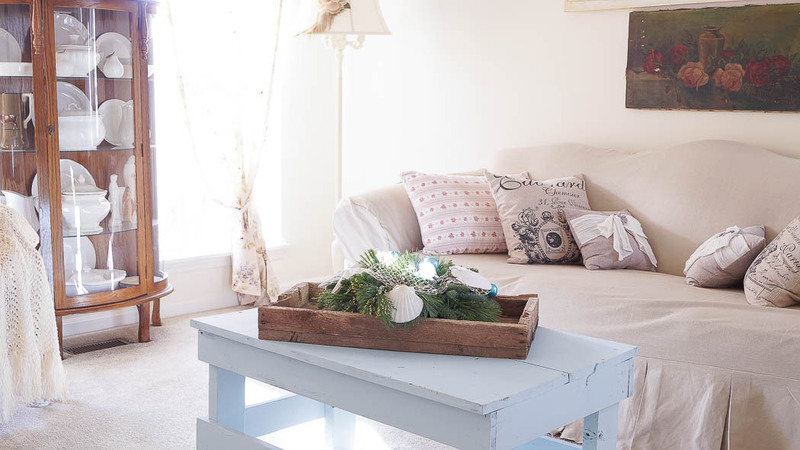 Your centerpiece also looks lovely on your coffee table and i love the colors. I love this post, and I agree that often “tablescapes” leave very little room for the actual food. The past few holidays I have been using an ironstone pitcher and bowl set I love, and I just change up what I put in the pitcher or inside the bowl. Right now I have pinecones and an autumn garland I bought at Michael’s, and for the Spring/Summer I just changed up the fresh flowers. Not sure yet how I will mix it up for Christmas, but probably the table runner and tablecloth and dishes will be more of a focus. Keep it simple is a great mantra to have! 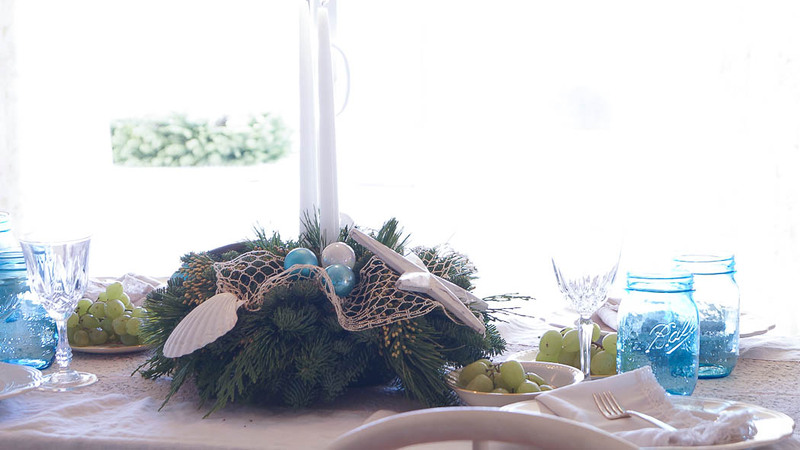 I love the coastal vibe of your table this year. That’s unique.